Brooks Automation prints continuous carbon fiber reinforced end effector prototypes that allow them to rapidly iterate without sending out parts to a 3rd party manufacturer. Brooks (NASDAQ: BRKS) manufactures automation equipment that handles high precision, fragile products like semiconductor wafers. To handle these parts, each machine system is precision designed — so much so that some parts could go through a couple of iterations before being finalized. With conventional manufacturing methods, each iteration stretches the development timeline by several weeks. In an effort to shorten its development cycle, Brooks added high-strength 3D printing to its workflow. By utilizing continuous carbon fiber 3D printing, Brooks drastically shortened its prototyping process. 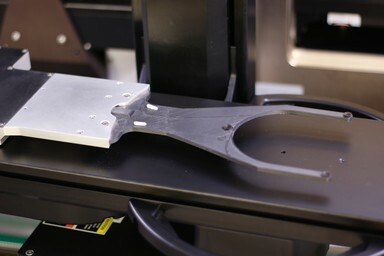 While their previous 3D printer couldn’t print prototypes robust enough to be functional, Brooks mechanical engineer Jeff Cavins says that Markforged printers allow engineers to “print thin enough and stiff enough to prototype the type of parts we’re looking for.” The fact that the prototypes are functional adds massive value — now Cavins is able to “take prototype parts into a meeting and show what the finished parts may look like.” Brooks now develops and ships systems faster with high strength 3D printers.